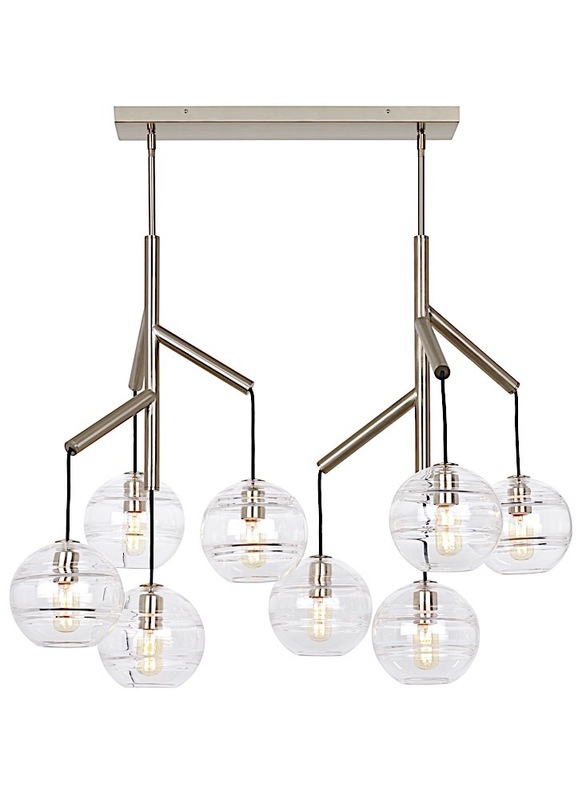 Each side of the Sedona double chandelier features four glass orbs from a branchlike central hub. Transparent glass orb is perfectly spherical and smooth on the exterior surface, the interior surface features gradually thickening bands of glass which are artfully crafted by talented artisans to add alluring visual interest and dimension to your space. Select this modern light for your kitchen island lighting, dining room lighting or living room lighting application. Its two fully dimmable vintage tubular style LED lamping options are not only energy efficient, but also allow you to customize these pendant lights to your desired ambiance. Available with smoke colored glass - please inquire. Incandescent version is rated for up to (8) 60 watt max E26 medium based lamp (Lamp Not Included). LED version has (8) 120 Volt 3.5 watt, 300 delivered lumens 2700K, medium base LED vintage radio lamp (included). Fixture provided with five feet of variable rigid stems (includes four 12" stems & two 6" stems). Ships with 1 foot of field-cuttable black cloth cord. Dimmable with LED compatible or triac dimmer.